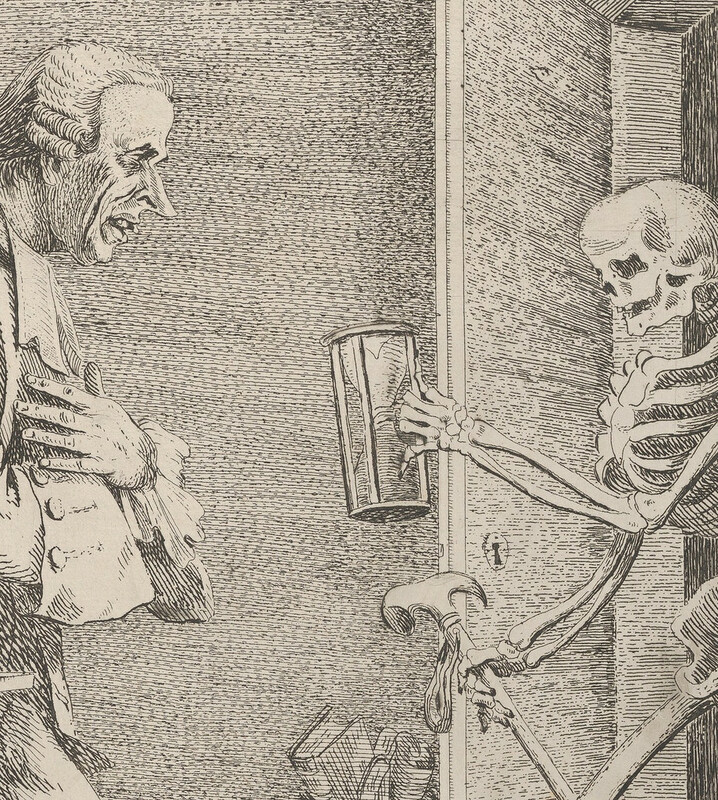 Looking at the engagement with mortality so important to the novelist’s groundbreaking work. 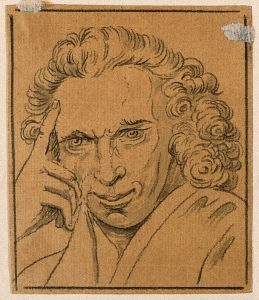 This year brings two notable anniversaries in the life of the Reverend Laurence Sterne, author of The Life and Opinions of Tristram Shandy, Gentleman. Two hundred fifty years ago, on February 27, 1768, he published A Sentimental Journey through France and Italy. By Mr. Yorick. Fewer than three weeks later, on March 18, aged just fifty-four, he died. 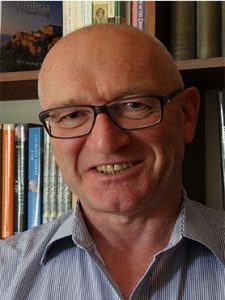 Few writers have passed their entire literary career so knowingly in the shadow of death as had Sterne. 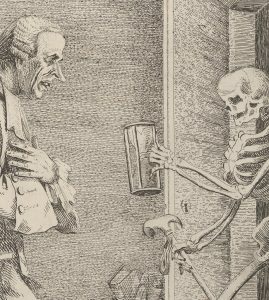 In the work of still fewer, least of all eighteenth-century comic novelists, does death appear so prominently or so pervasively. 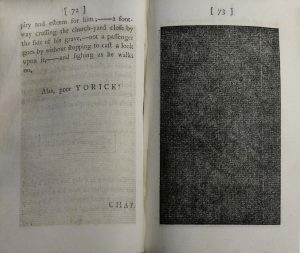 In the first of Tristram Shandy’s nine volumes, published in five instalments between 1759 and 1767, Parson Yorick, a fictionalised self-portrait of the author, dies. 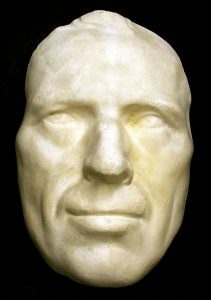 Three words are inscribed upon the plain marble slab that marks his grave, serving — as passers-by observe it — as both epitaph and elegy: “Alas, poor YORICK!” In Sterne’s novel, these all-too-familiar words face a wholly unfamiliar black leaf: a gesture towards the impenetrability of death that anticipates the many ingenuities that mark out Tristram Shandy as one of the most typographically original of all novels. Tristram Shandy is a comic fiction but there was little humorous about Sterne’s own relationship to death. As a boy, he experienced the death of four of his young siblings before he was himself eight. Having left Ireland for school in Yorkshire at the age of nine, he never again saw his much-loved soldier father, who died when Sterne was seventeen. Within a couple of years, when he was a student at Jesus College, Cambridge, Sterne experienced the first symptoms of the consumption — pulmonary tuberculosis — that would haunt him for the remainder of his life. Much later, when travelling abroad for his health, he vividly recalled the very moment: “I had the same accident I had at Cambridge, of breaking a vessel in my lungs. It happen’d in the night, and I bled the bed full”.1 Small wonder, perhaps, that Sterne’s comic masterpiece is punctuated by the deaths of the fiction’s most loved characters. By the end of Volume IX, not only Yorick but Tristram’s brother Bobby, his mother Elizabeth, and even that favourite of Victorian readers, uncle Toby, have all died, along with the courageous soldier, Le Fever, the account of whose death, excerpted from the novel’s sixth volume, was for long regarded as one of Sterne’s most sublimely touching achievements. NO_____I think, I said, I would write two volumes every year, provided the vile cough which then tormented me, and which to this hour I dread worse than the devil, would but give me leave . . .
Sterne’s second attempt to prolong his life by avoiding the rigours of an English winter took him to France from the autumn of 1765 to the early summer of the following year. It was this visit that furnished further experience of continental travel that he would make the basis of Yorick’s narrative in A Sentimental Journey. Sterne survived, still busy working on A Sentimental Journey, for ten months longer. When it was published, subscribers received along with their copies a printed apology that the work consisted only of two volumes and not the promised four. Sterne explained that he had been prevented from completing the work by “ill health” and expressed his optimistic though unfulfilled intention to deliver the missing volumes “early the next Winter”. 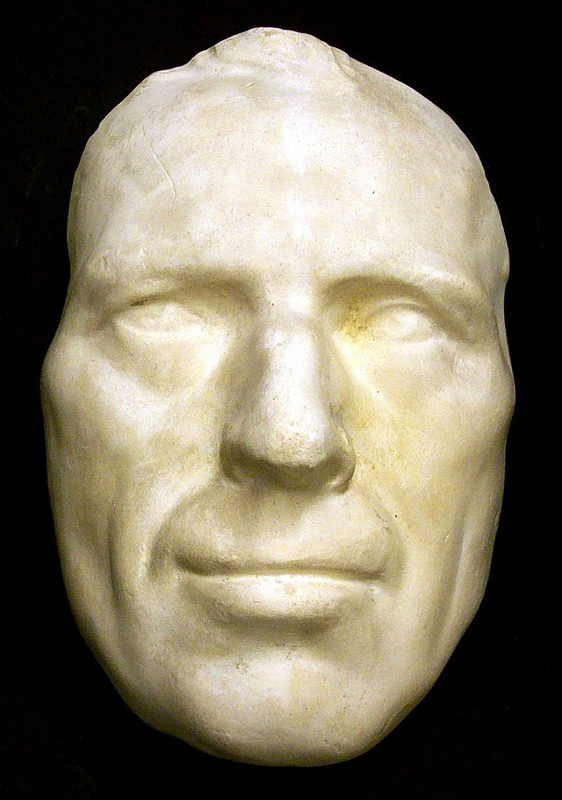 Death mask (though “Authenticity not verified”) of Laurence Sterne from the Laurence Hutton Collection — Princeton Library, Laurence Hutton Collection. In the event, death had the laugh on him. Sterne’s funeral took place on March 22 in the fashionable church of St George’s, Hanover Square. 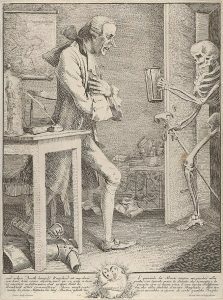 His body was buried in the church’s new graveyard, beyond Tyburn, only to be stolen by body snatchers and taken to Sterne’s old university, Cambridge, where it was dissected by the professor of anatomy, Charles Collignon. One of those attending the dissection recognised Sterne, and his body was subsequently returned to London for clandestine reburial. Yet the author of Tristram Shandy did not lie undisturbed for eternity. When the St George’s burial ground was scheduled for redevelopment in 1969, his great champion, Kenneth Monkman, succeeded in locating Sterne’s bones and had them reinterred next to St Michael’s Church, Coxwold. This was the village that Sterne had made his home after the local magnate, the Earl of Fauconberg, bestowed on him the living, along with those he previously held not far away at Sutton-on-the-Forest and Stillington. After two decades of making the best of things in precarious financial circumstances, Sterne was grateful enough for this handsome testimony to the extraordinary success the first instalment of Tristram Shandy brought him. Nevertheless, throughout the remainder of his life, Sterne left his new dwelling as often as possible, to revel in the celebrity he enjoyed in London for, as he asserted, “I wrote not [to] be fed, but to be famous”.16 Today, his remains lie across the road from his parsonage house in an otherwise obscure Yorkshire village far distant from the English metropolis. Sterne would have recognised and, perhaps, enjoyed the irony. 1. Sterne to John Hall-Stevenson, August 12, 1762; Letters of Laurence Sterne, ed. Lewis Perry Curtis (Oxford: Clarendon Press, 1935), 180; hereafter Letters. 2. Laurence Sterne, The Life and Opinions of Tristram Shandy, Gentleman, ed. Ian Campbell Ross (1983; new ed. Oxford and New York: Oxford University Press, 2009), VII, i, 385; all further references are to this edition. 4. Sterne to the Earl of Effington, May 29, 1765; Letters, 248. 5. 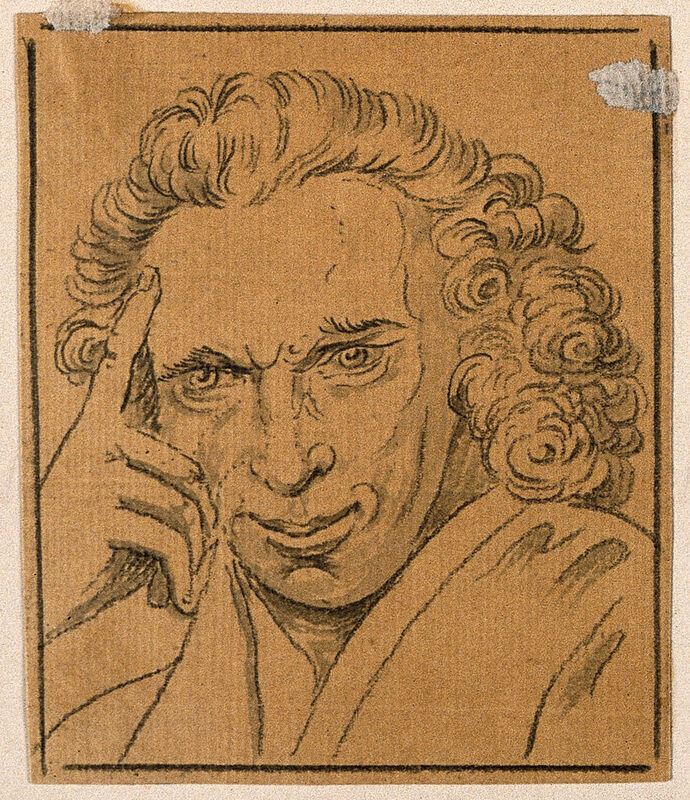 Laurence Sterne, A Sentimental Journey through France and Italy. By Mr. Yorick, in A Sentimental Journey and Other Writings, ed. Ian Jack and Tim Parnell (1968; new ed. Oxford and New York: Oxford University Press, 1968), 101; all further references are to this edition. 6. A Sentimental Journey, 172-3. 7. Sterne to John Hall-Stevenson, February 5, 1766; Letters, 269. 9. Sterne to Dr. Richard Gem, March 30, 1766; Letters, 275. 10. Sterne to Mrs. Daniel Draper [i.e. Eliza] ?March 30, 1767; Letters, 320. 12. John Macdonald, Memoirs of an Eighteenth-Century Footman, ed. Peter Quennell (London: Century, 1985), 92. 15. Sterne to Mrs. [Elizabeth] Montagu, [? March 1768], Letters, 416. 16. Sterne to Dr. *****, January 30, 1760; Letters, 90.